Work, family, friends and fun. How do you stay in touch and still get things done? Using a headset can help. Mobile convenience and hands-free productivity to fit every need. 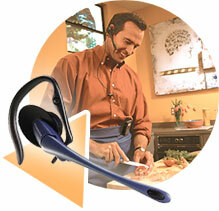 Mobile headsets can maximize your productivity by freeing your hands to handle other tasks, while you talk. At home. In the garden. Or on the go. Experience the freedom, comfort and great sound quality of a Plantronics headset. Do more. Comfortably. Plantronics offers a headset design and style to fit your individual needs—all with the quality and proven reliability Plantronics has been providing for over 40 years. These mobile headsets use state-of-the-art technology to offer unsurpassed comfort and performance. Try one of these Plantronics headsets, and free your hands today! CT14 Cordless Headset Phone 80057-01 Over the Head (monaural) Wireless Plantronics’ CT14 DECT Cordless Headset Phone offers interference-free calls and the ideal combination of size, mobility and hands-free convenience. The integrated headset features a noise-canceling microphone for superior sound. S12 Telephone Headset System 65145-01 Over the Ear & Over the Head (monaural) Cored Hands-free convenience and superior sound clarity with a 2-in-1 convertible headset. T20 Headset Telephone 45162-11 Over the Head (monaural) Cored The T20 is a complete dual-line telephone with convertible headset. MX500i 3-in-1 VoIP Headset 72517-01 Over the Ear Cored Versatile 3-in-1 design connects to your computer, cordless phone, and most cell phones (requires a 2.5 mm jack). Use this headset to make calls in three ways: make Skype and other Internet calls through your computer’s USB connection, connect it to your cordless phone, or use it with your cell phone. M220C Headset for Cordless Phones 65544-20 Over the Ear Cored The Plantronics M220C Headset for Cordless Phones combines an innovative design with a noise-canceling microphone, resulting in a stable, great-sounding headset. M214C Headset for Cordless Phones 69056-11 Over the Head (monaural) Cored Designed specially for use around the house, the M214C Headset provides an economical, hands-free solution for taking calls on your cordless or cell phone while you attend to your many duties. M175C Headset for Cordless Phones 45632-61 Over the Ear & Over the Head (monaural) Cored Sound quality is enhanced with a noise canceling microphone and pivoting mouthpiece that provides optimal voice clarity. Two wearing styles provide a secure and comfortable fit for all-day comfort.